Mad Hatter Bar and Grill may be the best kept brunch secret in Greensboro. And they offer it on Saturday AND Sunday!! I've visited for lunch, dinner and brunch, and though they do all well, they do brunch best. Mark Weddle's specialty Bloody Marys are a must. 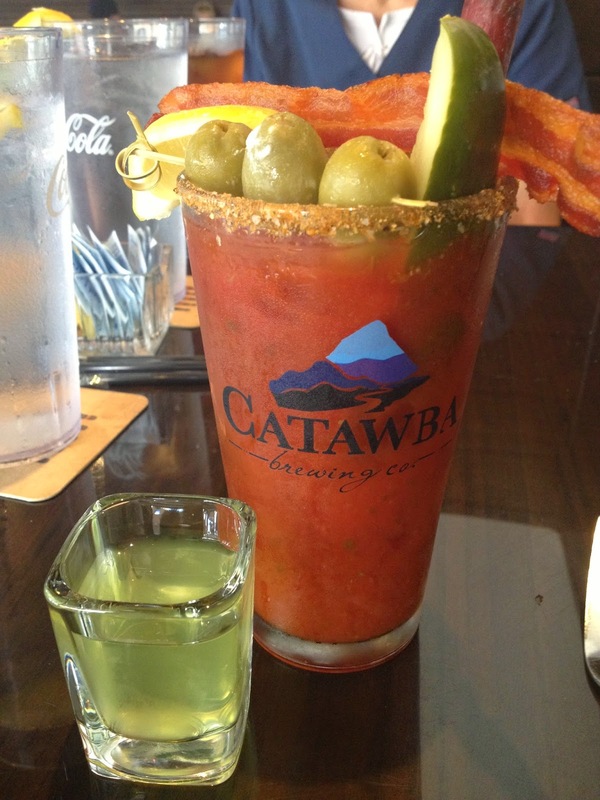 (Seriously - Mark placed #1 in the Absolut Vodka Best Bloody Mary competition, and went on to compete nationally!) I chose the Mary Pickleford, featuring Mark's Bloody Mary Mix with Whiskey, Blue Cheese-Stuffed Olives, a piece of Bacon, a Dill Pickle and a Beef Jerky straw, which you sip the Bloody through. It's served with a shot of Pickle Juice on the side. This is essentially a meal. I can't wait to try their Tequila and PBR versions! The Vegetarian Benedict shakes up the most boring brunch item to ever cross a menu (Eggs Benedict) and totally blew my mind. A Chickpea Polenta Cake serves as the base, and it's topped with garlicky, sauteed Spinach, Goat Cheese, two Poached Eggs and Romesco Sauce. The flavor combination sings. It's sensational. Every bite works. This is one of the most unique and satisfying brunch dishes I have ever encountered. All other Benedicts should bow before this dish. For other meals, the NadaBurger - a Turkey Burger with Provolone, Pesto and Dijon - is a great concept, but a little too wet. I had trouble with the bun and all the condiments staying together. Stick with the Hot Pimento Cheese Dip and Pizzas (the Pulled Pork variety is especially good), Salads or their fabulous Brunch. You really can't go wrong with brunch. I'll be returning as soon as humanly possible.